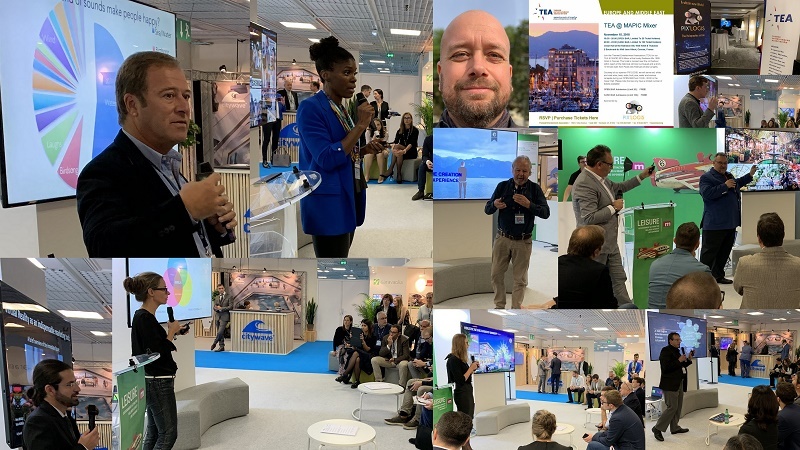 In November 2018 the Themed Entertainment Association (TEA) participated for the second time at MAPIC, the annual, international retail property market held in Cannes, France. "The first session focuses on the impact that the merging of retail with leisure has already had: this is a growing, fast maturing industry that provides notable, attractive experiences as well as measurable results. The next session focuses on what the next thing will be in the immediate future. This is not a look in the crystal ball, but a look around the corner on what is happening or about to happen right now. "Many of us share the notion that physical retail needs to evolve to stay relevant. If you don’t stay relevant, you will eventually disappear, no matter how big your brand is. Consequently, the new retail space experience industry is accelerating and maturing, and it represents many new opportunities for those well versed in creating compelling places. 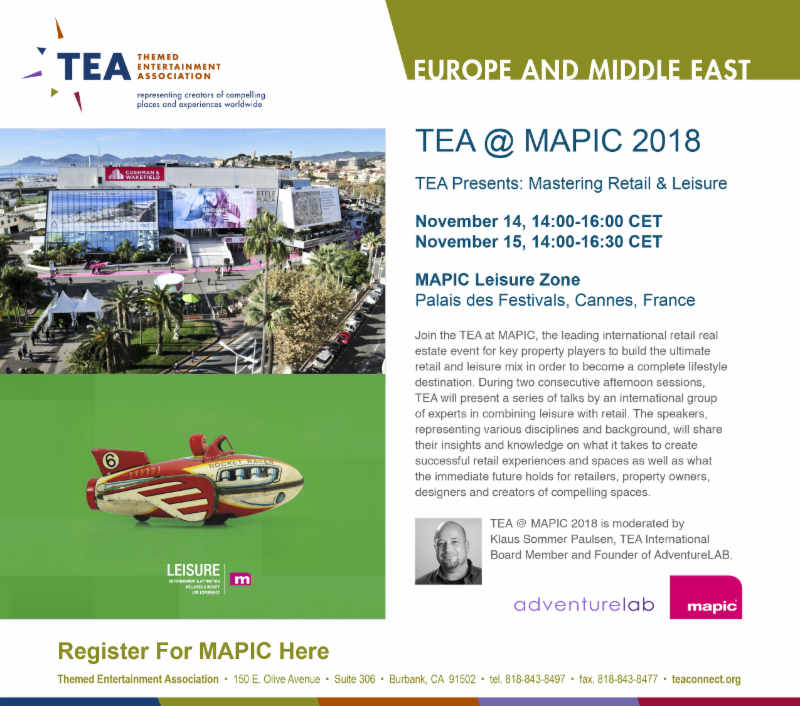 TEA's presence at MAPIC lets the retail property industry know that the leading experience industry experts are to be found among the TEA membership. "Barking dogs are just one of the memorable moments and insights that the audience will take back with them. 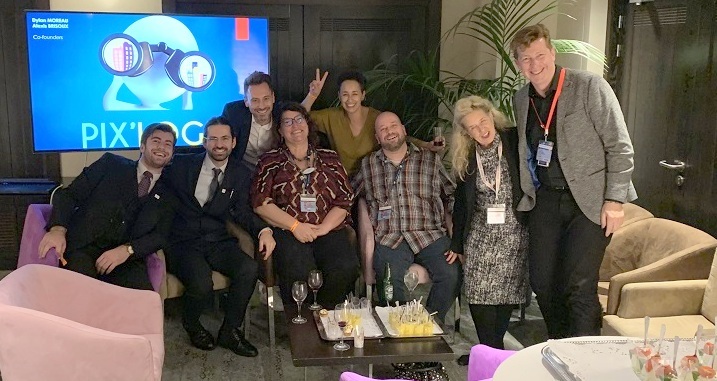 We put together a program with an international group of speakers who shared their expertise and mindset from the forefront of the leisure and experience industry. In total, we had 12 speakers from 8 countries, most of them from within TEA. "Both sessions took place in the renewed Leisure Zone at MAPIC, where an open space with cozy furniture created a friendly environment for sharing and interaction. In this informal setting, the audience members could readily take in the wit and wisdom from speakers right in front of them. "And wit and wisdom were indeed shared. 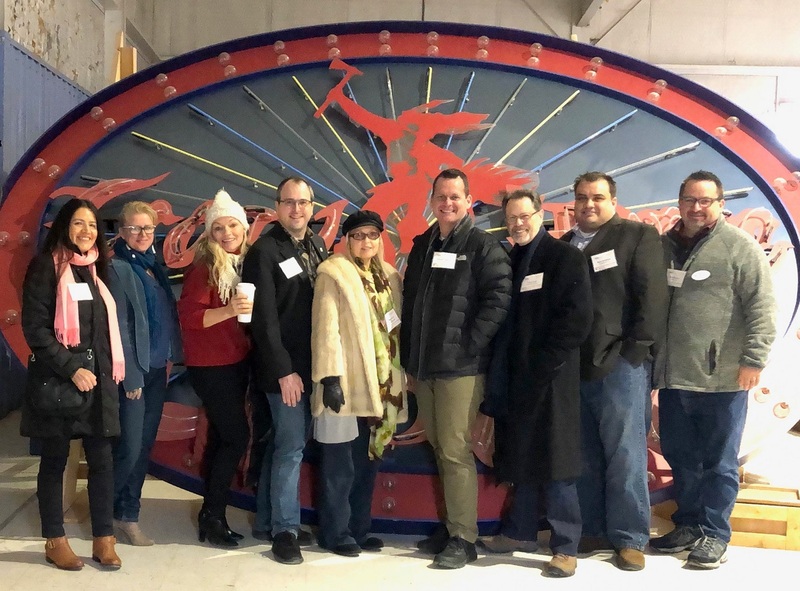 Among the many memorable moments and knowledge shared, Cliff Warner of Mycotoo Inc., and Reoewein Niesten of Conceptional took the audience’s understanding of retail F&B to a level well beyond the popular buzzword 'eatertainment.' Louis Alfieri of Raven Sun Creative, Inc. let people get a glance into the creative mindset and design toolbox that allows brand spaces to expand beyond their location. Thibaut De Lestré, MADGIX expanded the idea of space from location to multi-location. 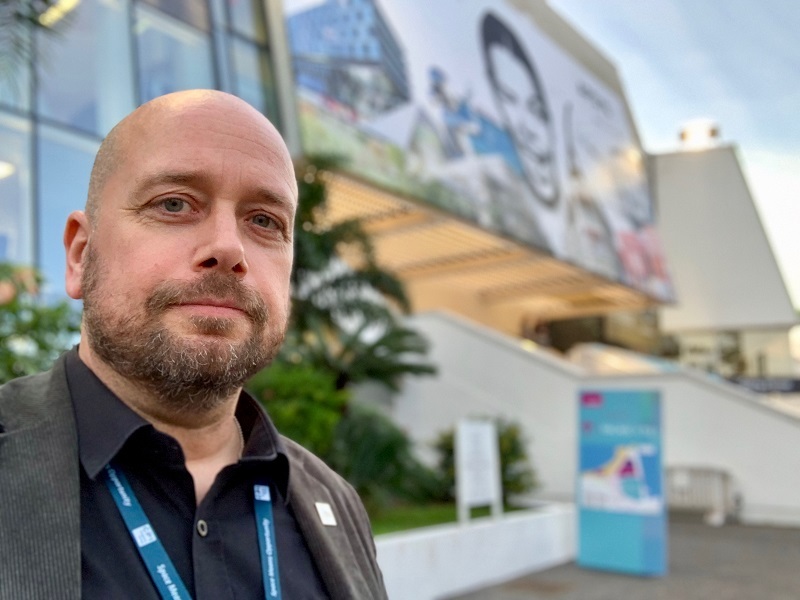 "Alexis Brisoux and Dylan Moreau of Pix'Logis, a brand of TEA member company Pix'Group (also sponsor of the TEA-at-MAPIC mixer) spoke to new perspectives on expanded realities. Nicole Srock.Stanley of dan pearlman Erlebnisarchitektur GmbH shared her insight and knowledge of new retail-leisure hybrid spaces. Veneta Yanyova of Walltopia Adventure brought forward a holistic mindset of retail-tainment and activation, while Fri Forjindam from Mycotoo presented how working in unison with brand activation is a win-win collaboration for space owners and operators. "In the final, mind-opening talk, Albert Boswijk from The European Centre for the Experience Economy spoke to the strategic and psychological depth of creating value through experiences. Creating success for retail spaces through the evolution of the retail experience will demand much more than buying an experience in a box and install it into a mall or another kind retail zone. It takes strategic thinking and organisational willingness from the level of top leadership to truly create the understanding and the culture that will be needed to succeed. 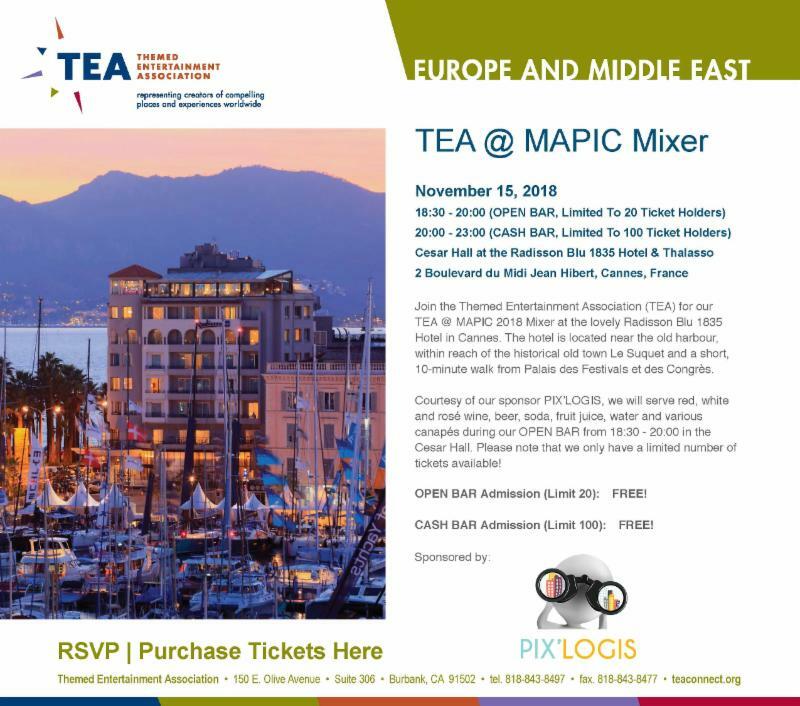 "Many thanks to all who supported the TEA presence at MAPIC in 2018, including the sponsors of the TEA activities, and the organizers. 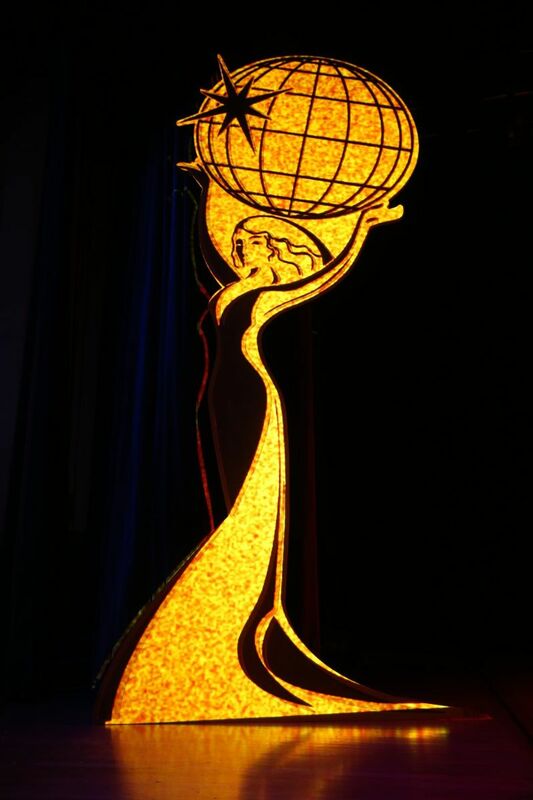 Special thanks to all the speakers, their assistants and coordinators, and the Reed MIDEM team behind MAPIC. 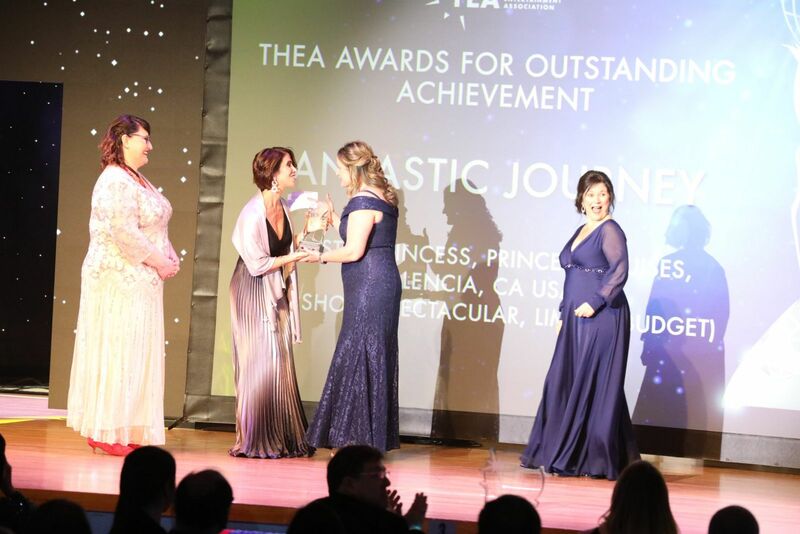 Very special thanks to TEA Europe & Middle East (EME) Board member Cynthia Vergon of InFact Global for her generous gift of time and assistance at MAPIC.